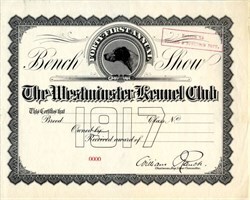 Beautiful RARE specimen certificate from the Westminster Kennel Club printed in 1917. This historic document has an ornate border around it with a vignette of a show dog and is over 102 years old. The Westminster Kennel Club Dog Show is a two-day, all-breed benched conformation show that takes place at Madison Square Garden in New York City every year. The first Westminster show was held in 1877. The first Westminster show was first held on May 8, 1877, making it the second-longest continuously held sporting event in the United States behind only the Kentucky Derby, which was first held in 1875. The show originated as a show for gun dogs, primarily Setters and Pointers, initiated by a group of hunting men who met regularly at the Westminster Hotel at Irving Place and Sixteenth Street in Manhattan. They decided to create a kennel club called the Westminster Kennel Club specifically for the purpose of holding a dog show. The prizes for these first shows included such items as pearl handled pistols, of use to the hunters and terriermen who worked these dogs in the field. The first show took place in May 1877 at Gilmore's Gardens (the Hippodrome). That show drew over 1200 dogs and proved so popular that its originally scheduled three days became four, with the club donating proceeds from that fourth day to the ASPCA for creation of a home for stray and disabled dogs. Because of space considerations at Madison Square Garden, the entry is limited to 2,500 dogs and fills immediately on the first day that entries are accepted. Since 1992, the club has invited the top five dogs in each breed to be pre-entered (determined by the number of dogs defeated at shows during the previous year) to assure that all the top dogs have the chance to compete. Today, Westminster takes place over two days and nights every February. During the day, the dogs compete at the breed level (i.e., against other dogs of the same breed). Each Best of Breed winner (BOB) advances into its respective group, of which there are seven (Sporting, Hound, Working, Terrier, Toy, Non-Sporting, and Herding). Group competition is held during the evenings, and the seven group winners advance into the final competition, which one judge will select one of them as the Best In Show winner. Competition in Junior Showmanship (for handlers ages 8�18) has been held since 1934. The eight finalists all receive scholarships for post-secondary schooling. In addition, each year the club (through its Westminster Kennel Foundation) awards veterinary school scholarships for students from six schools. The show has been broadcast on live television since 1948 and today is one of USA Network's highest-rated sports specials. The program typically airs on a Monday and Tuesday. The Monday night broadcast begins on the USA network and then switches over to CNBC due to the airing of WWE Monday Night Raw. In the past the WWE show would be preempted but that is no longer the case. At the Garden, it has enjoyed sellout status since 2005, as tickets sell quickly once they go on sale each Fall. Indicative of its amazing worldwide popularity, more than 700 press credentials are issued to media attending in person from more than 20 countries. In addition, each year the Westminster Web site (www.westminsterkennelclub.org) has millions of visitors from around the world (about 12 million page views by users from more than 170 countries). The winning dog becomes "America's Dog" for the next year, and also becomes the world's newest single name celebrity. It begins its reign with a media tour on the day following the show with appearances on virtually all television network morning shows, a visit to the Observation Deck at the Empire State Building, and much more. 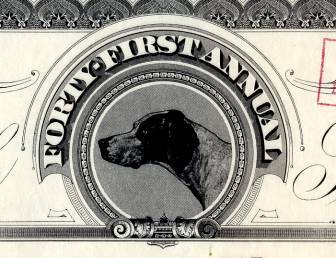 In 1884, the AKC began requiring that all dog participants be registered with the AKC and recognized for conformation show competition. In 2011, there are 179 breeds and varieties eligible for Westminster. This includes six new breeds: Boykin Spaniel, Bluetick Coonhound, Redbone Coonhound, Cane Corso, Leonberger, and Icelandic Sheepdog. Because of the show's popularity and prestige, starting in 1992 the AKC limited entries by requiring that dogs must have already earned their breed Championship before appearing at Westminster. Through the 134th Westminster Show (February 2010), Best in Show has been won by the Terrier Group 45 out of the 103 times that the prize has been awarded since 1907, more than twice as many wins as any other group. The single breed that has won the most is the Wire Fox Terrier, which has won 13 times. Two of the most popular dog breeds in the United States have never won Best in Show, the Labrador Retriever and the Golden Retriever. The 2010 winner of Best in Show was Ch. Roundtown Mercedes of Maryscot (aka: "Sadie"), a Scottish Terrier. Sadie had already won 112 best-in-show ribbons at other shows.